Johannesburg - Two powerful South African football women appear in the latest list of the Confederation of African Football (CAF) committees. 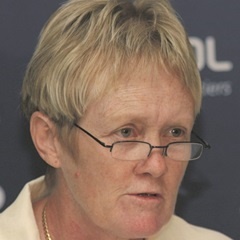 They are South African Football Association (Safa) executive committee member Natasha Tsichlas, who is the former boss of Mamelodi Sundowns, and Fran Hilton-Smith, who is Safa’s assistant technical director. Tsichlas is a member of the Organising Committee for Women’s Football while Smith serves in the Technical and Development Committee. They are among six South Africans who serve in different CAF committees, a list of which was released by the continental organisation recently. Others are Safa president Danny Jordaan, PSL chair Irvin Khoza, Safa executive committee member Poobalan Govindasamy and Ephraim Kramer. Safa president Jordaan is a member of the CAF executive committee, deputy chair for the Organising Committee for the Africa Cup of Nations and heads the Organising Committee for Youth Africa Cups of Nations Under-17, 20 and 23, while Khoza is a member of the Organising Committee for Interclub Competitions and Club Licensing with Govindsamy serving in the Development Committee for Futsal and Beach Soccer while Kramer is part of the Medical Committee. “I am very happy and excited to be in this committee, particularly because it is headed by Kalusha Bwalya of Zambia, whom I highly respect,” said Hilton-Smith. “Serving in this committee provides me with a platform to raise pertinent football issues, not only on women but men’s football as well". Hilton-Smith also revealed that she had been nominated by CAF to represent the continent at the Women’s Football Conference in Amsterdam next month. She will then have to bring back a report for the entire continent. Tsichlas, a veteran in football administration, was also over the moon that she had retained her position within the committee that is in charge of women’s football on the continent. “I regard my appointment as the continuation of women’s football development in Africa,” she effused. “I am very proud and also very encouraged because I have noticed that the new CAF executive regards women’s football very highly". She said she was pleased with the development of the game in this country although she feels much still needs to be done. “I’m just proud that I represent a country [South Africa] that has a very strong national team from which I think many other African countries can learn something". Tsichlas said now that the Africa Women’s Cup of Nations was a well-developed tournament, there was a need to strengthen the Under-20 and Under-17 events.